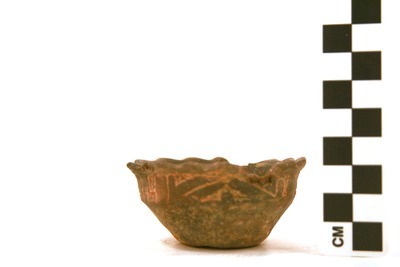 "41CP12, Burial 18, Pot 14" by Timothy K. Perttula and Robert Z. Selden Jr.
DECORATION: The rim has four engraved panels (defined by sets of vertical engraved lines) with alternating nested triangles. In each case, each panel has three nested triangles, two at opposite ends of the panel and the third either above or below the other end, and set so that its apex points between the two other nested triangles. The nested triangles are either excised, hatched on the corners, or have negative ovals.